Eros Flame is a new perfume by Versace for men and was released in 2018. The scent is sweet-synthetic. It is being marketed by EuroItalia. With the original Eros I never got really warm. But the flame generates at least some sparks. Does he also have what it takes to ignite a flame? I especially like the combination of mandarin m, orange and pepper, which replace the synthetic mint and the apple in the original The DNA of the original is definitely recognizable and both scents move close together in the course. It is a good designer fragrance, which is very popular with the younger ones. But at the same time it is again "only" a designer fragrance without being really unique. After all, he is long lasting and by and large worth his money. For me personally it is just too typical and absolutely no reinvention. Those who already have Eros do not necessarily need to have it in their collection. 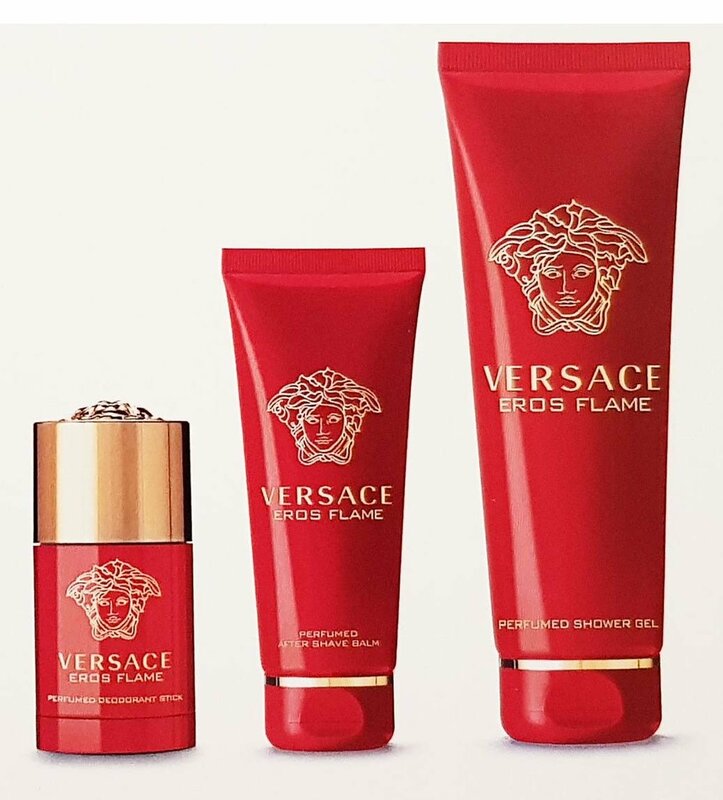 Versace Eros Flame is an autumn/winter/clubbing fragrance which is relatively similar to Versace Eros in drydown. What I didn't like at all about Eros was the top note. This vinous, slightly mint-scented top note. It can be used in the drydown, but is not necessarily my favourite among the clubbing fragrances. The advantage of Eros is it's a summer scent. Eros Flame is the winter opponent. Delicious orange-smelling opening, which packs immediately. Patchouli, still the orange touch and a slight sharpness, can be found in the heart note. The durability is outstanding. 10 hours safe. The better Eros. Don't let the price seduce you and rather buy the more expensive Flame. The scent DNA is very similar to that of the predecessor. For me, Flame is a bit more discreet and dignified than its predecessor, which is mainly due to the woody notes. 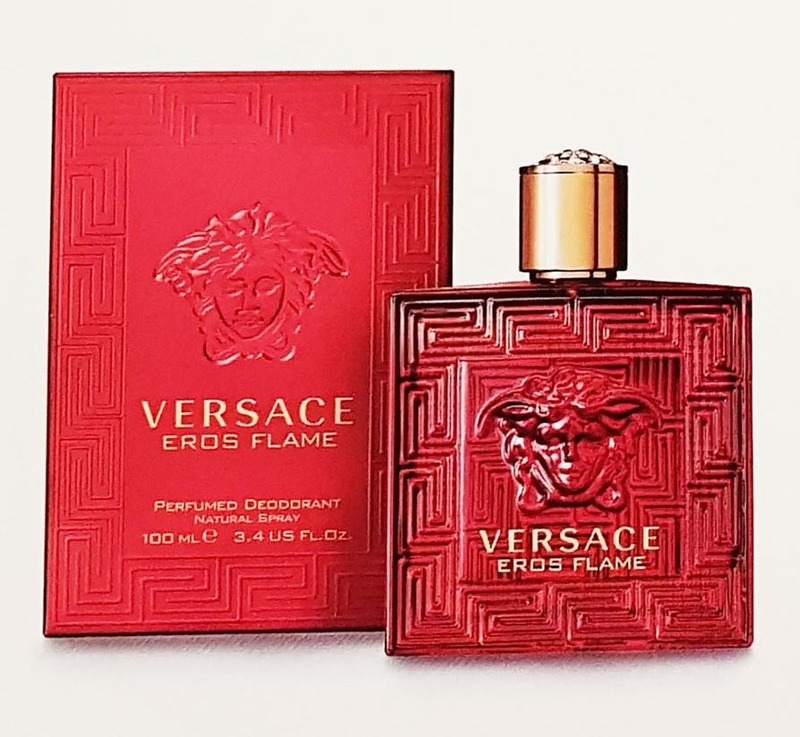 When I smell Versace Eros Flame, I think of a young man with a casual dress style, but wrapped in a dashing jacket. An Italian gentleman on his party prowls, looking for himself and a girl who can stand up to his temperament. Successful flanker to the Versace Eros, which for me fits more to the casual look. The synthetic, but in my nose not unpleasant fragrance DNA is almost identical, which is why I would not necessarily advise Versace Eros owners to buy it. But if you are looking for a more discreet, quieter Eros, you will find it here. Eros flame, the new born of the (no more)Italian brand, represents to me all the facets of love, from the initial euphoria, passing by the romanticism to the burning passion ; the red squared bottle with the unmistakable logo is the right "dress" for this very pleasant and multifaceted scent I consider absolutely genderless, just like love might be. The first time I sprayed this scent I perceived immediately the powerful citrusy -juicy accoird with the interesting peppery touch. Then, I smelled a light rose note at the heart, giving a touch of tenderness and romanticism to this composition. Finally, the base notes: a symphony of deep Woods, sensual patchouli and sweet and warm vanilla. it's a perfect harmony. it's LOVE made fragrance. IAs I said, I recommend this scent to women too, because its sillage is strong but not too heavy and "masculine". It's a 4 seasons scent because its juicy and fizzy opening is perfect in summer too, maybe by night, but its base is deep and makes this scent wearable by day when the weather is colder. I think it's no coincidence that this new fragrance has been launched for Christmas time ! It could be the perfect Xmas present to enjoy all the days of the year. The price for a 100ml size is quite high but not impossible (about 80€) but maybe you can find it also on sale at the drugstores or online. Ready to smell the "50shades of red"? During yesterday's Christmas stroll I used the time for a test of the new Eros Flanker. I've known him for a long time and now I've seen him in the store and sprayed him on. Spontaneous. I was already curious, because I own the original and the red version seemed interesting to me. The original is a polarizing scent. A love-ot-hate scent. I can understand both sides, because he's a full-twelve. But a lot of ladies, especially young ladies, love him. I also like it but rarely wear it as it is too pushy and obtrusive on many occasions. Then a Flanker seemed interesting to me. The bottle is typically Versace. Cheerful and pretty. This time in red with golden lid. The nickname Flame was chosen. In my eyes a suitable name to the bottle and fragrance. The first thing I have to say about the description of the fragrance is: This is a flanker that is extremely close to the original. If you are looking for an independent and completely different fragrance, you will be disappointed here. But: Never change a winning team. The original is highly placed in many sales lists. What stands out positively here is that the opening is much fresher and not so overwhelmingly penetrating. Where the original is very minty, here is placed on citric notes in the foreground. And a nice subtle spice. Later he approaches his predecessor. Approx. 30 minutes and one recognizes very strong similarities to the original. The sillage and the penetrance are slightly dimmed down and still well perceptible. After the mentioned 30 minutes it is fresh, woody, sweet and slightly seasoned. In the base the wood comes out extremely and harmonizes well with the sweetness. The base and the dry-down are very pleasant and sensual. Those who like the original will also like it. Especially due to the strong similarities. Durability is absolutely good. At least 10 hours he holds with bravur. The Sillage is slightly dimmed but still very good and above all pleasant. While the original is mainly a party and night scent, Eros Flame could also be worn in everyday life. Maybe not in the office but you won't get crooked looks like you might get with the original. I have stupidly overslept the day - and must now atone for my indulgence, because I am awake like a bell. I would like to ride my bike around the table - I am so inappropriately awake. Already geyoutubed, eaten, smoked, mailed to the USA, because there the clocks tick differently. Maybe Eros Flame makes you tired? No, already the tingling pepper note speaks against it. It's more of a wake-up call than a nightcap. The lemon is also invigorating. I guess I'll be on guard duty for a while. A recommendation for night workers. But then the lively fragrance experiences some peace through soft rose and creamy sandalwood. The flame is rounded off by a soft, delicate sweet vanilla. But silence does not yet return. The flame flickers even further in the almost sweet finish. Despite his sweet echoes, Flame is for me a men's fragrance, because he has quite masculine traits. On a real guy he will probably look very apart and exciting. The spicy and the sweet are also an interesting contrast. Flame does not have corners and edges - but it is not boring. I'll make it short: It's Versace Eros with lemon instead of apple/mint and in red. The rest is equal. If you like you can catch some more details below. Head: Clearly lemon, which somehow always buzzes along, but is never dominant or disgusting. Smells like. Heart: Mixture of lemon and synthetic sweet vanilla/tonka mix. Second exactly like the blue Eros. Base: Same as heart, but with less lemon. Lasts quite long on clothing and skin. Sillage is quite strong. Performance is therefore TOP. Yes: going out, leisure, club. Good addition to the previous Eros, but nothing earth-shattering. ... and that's the beauty of the fragrance world again! My previous experiences with the original Eros were consistently good. Durability, as well as Sillage and fragrance themselves have convinced me and my environment. So it happens that Eros is my previous compliment magnet. I'm a fan of fresh-sweet scents. Yes, a little bit of synthetic is not to be dismissed, both with the old and with his new 'Flanker brother'. With this release you can recognize the original DNA of the original right from the start, which remains somehow present during the whole fragrance process. Something in the background, but always there. This is accompanied from the beginning by a really beautiful freshness. The comparison of another user to the WC duck I can not understand with the best will in the world. But that's just how tastes are different. Eros Flame is always freshly sweet, slightly sugary, but not sticky. Despite the light synthetics, you still notice a quality in the fragrance, which in my opinion also distinguishes Versace. They manage to bring pleasing and quite independent fragrances onto the market which, although slightly synthetic, nevertheless offer a certain quality. Durability is also good here, could still smell traces on the skin after 12 hours, even after the shower. Sillage is moderate, no beast but also none that hides permanently. Every once in a while it rises pleasantly into your nose. In my eyes, the somewhat fresher impact makes it much more versatile than its predecessor. I think this one is great to wear from autumn to spring, during the day as well as in the evening. So far I only got one bottle through a sharing and tested it in the turquoise D before, but I think there will soon be a complete bottle in my house. Once again one can say: Well done Versace! Today I tested him for the second time at the drugstore. It came the disillusionment. A bitter-sweet citric mixture that I no longer liked today. Synthetic sweet. Addresses a younger group of buyers, even from the bottle alone, which is quite nice. Paco Rabanne UltraRed is for me so far the reference of a good synthetic fruity fragrance, there Eros Flame does not come to ran. No purchase option for me. There it is now, the Medusa in red. The typical Versace DNA is immediately recognizable, as in Versace pour homme or (earlier) in V/S. This time, however, the durability has been tinkered with, and with success. Those who like it slightly sweet, but not sticky a la 1 million, will get their money's worth here. EF is a pleasant companion for the day and the evening, a fragrance that is sure to go down well and with which you can do nothing wrong. That's enough for me. Big plus!